This week’s podcast features a Podwits first as J. Marcus becomes the first Podwit to dial in from orbit! Exactly what he’s orbiting is unclear, though he seems to have broken the space-time continuum, causing him to speak somewhat out of sync with reality! Can Dion and Brian save him, or will he be lost forever? 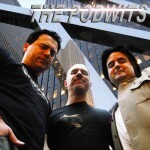 In other news, the Podwits celebrate a few birthdays, sling some news and generally have fun! What kind of person would you be if you DIDN’T listen?